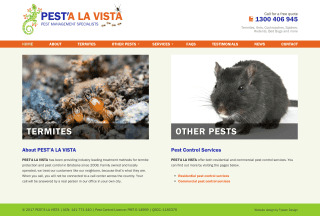 Pest'a La Vista is a family-owned pest control business that has been operating in Brisbane since 2008. When they came to me they had an old Joomla website that was hard to update and didn't work well on phones or tablets. The owner also wanted a different design and to change the business's logo. In close collaboration with the business owner I came up with a lighter, fresher design, a new logo, and powered by Processwire, rebuilt the site to be faster, easier to update, and compatible with all modern devices.